A.E.G.I.S., the Advanced Expert Group for Intervention and Security, is the premiere superhero law enforcement agency in all of Halcyon City. Its power is enormous; its actions, dangerous; its goals, secret. The agency is both respected and feared in equal measure. 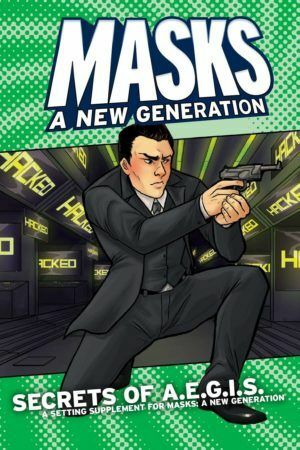 Masks: A New Generation is an ENnie-award winning superhero roleplaying game in which a team of young heroes fights villains, saves lives, and tries to figure out who they are—noble paragons? Dark avengers? Or regular kids? All against the backdrop of Halcyon City, the greatest city in the world and home to the Advanced Expert Group for Intervention and Security—A.E.G.I.S. 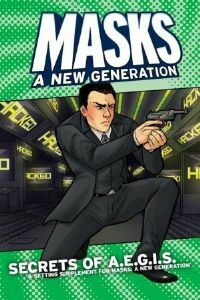 In Secrets of A.E.G.I.S., you’ll find everything you need to play a Masks game centered around A.E.G.I.S. and the myriad conflicts that superhuman law enforcement brings. Does your team of heroes have what it takes to delve into the deepest, darkest secrets of A.E.G.I.S.? Time to find out.